Floyd Mayweather will go down as one of the greatest fighters to ever lace up — and most definitely one of the best defensive fighters to ever live. He started off his career signing with Top Rank, and beating quality guys like Jose Luis Castillo, Diego Corrales and others. Floyd then decided that he deserved more money, and took the same approach as Oscar De La Hoya, creating his own promotional company, and accelerating his career by promoting himself a way he believed would make him one of the highest-paid fighters in the sport. Undoubtedly, Floyd had the perfect tools to accomplish exactly what he wanted. Mayweather Jr. exploded his financial career by getting high pay days against De La Hoya, Canelo Alvarez, Manny Pacquiao, Conor McGregor, Shane Mosley, Miguel Cotto and others. Not to mention the 6 fight deal he signed with Showtime/CBS worth $250 million. If nothing else, Floyd certainly lived up to his nickname, “Money”. Throughout his career, Floyd took calculated risks on when he would be fighting his opponents. It was risk vs reward: How can Floyd capitalize on his career, without suffering set backs? A possible Pacquiao fight got dragged out from 2010 all the way to 2015. Sure, it wasn’t all of Floyd’s fault, but in the end, the ball was in his own court, and he was his own boss. If that was a fight that he absolutely wanted, the fight could’ve happened sooner. Instead, Floyd offered tons of excuses on why the fight wasn’t going to happen — too many to even name. Going back, respected writer Thomas Hauser spoke with hall of fame match-maker Bruce Trampler, who remembered a time when Floyd was still a Top Rank fighter. Bruce stated that Al Haymon, a long time advisor of Floyd’s — and hundreds of other fighters — did not want Bruce to mention Antonio Margarito to Bob Arum as a possible opponent for Floyd. Back then, Margarito was regarded as one of the most dangerous welterweights in the sport. No one in boxing is really shocked by it. Floyd also didn’t fight a lot of the fighters in their prime. But this has nothing to do with knocking Floyd off any all time great lists. He got the job done by beating every opponent that was put in front of him (although many thought that he suffered his first loss to Jose Luis Castillo in their first fight). But besides Margarito, Floyd never fought heavy puncher, Kosta Tszyu, and a couple other fighters. Flash forward to today. Floyd, now “retired”, is focusing on other business aspects in his new career. One of them is his own promotional company in Mayweather Promotions. His top fighters are Badou Jack, Gervonta Davis, Thomas Dulorme and prospects like Andrew Tabiti. It’s not a overwhelmingly popular stable of fighters, but he certainly has some respectable guys at his disposal. 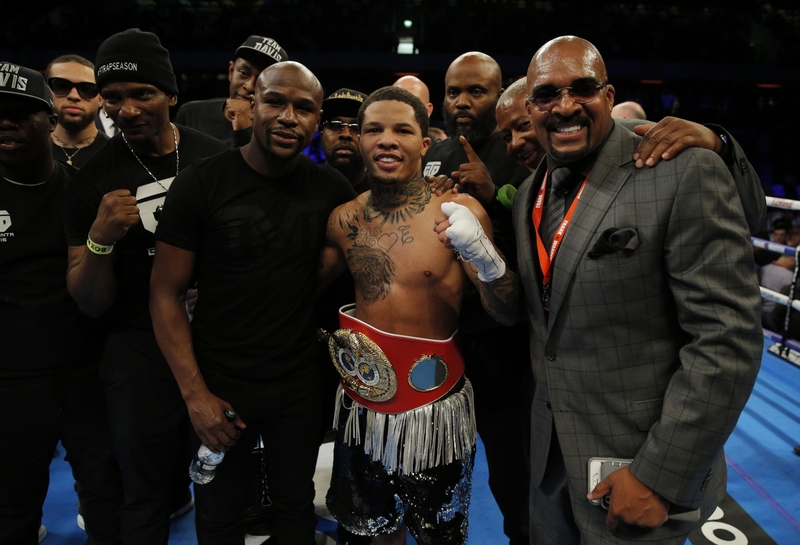 Perhaps Gervonta Davis is his prized pupil, who he hopes can climb up the ranks as a possible pay-per-view attraction. Davis is currently 23 years of age and has a record of 19-0 with 18 of those wins by knockout. He fights in the junior lightweight division and is regarded as one of the most talented in the weight class. Last January, Davis fought Puerto Rican Jose Pedraza for the IBF belt. A win would classify Davis as one of the best in the division and a clear title holder. Davis won in exciting fashion by knocking out Pedraza, who himself, was regarded as one of the best in the division. A few months later in the United Kingdom, Davis knocked out Liam Walsh, and made himself a clear standout in the division — a division in which Vasily Lomachenko was dominating. After the Walsh win, people began the talk on a possible Lomachenko vs Davis fight. In the post fight press conference, a reporter asked about the idea of fighting Vasyl Lomachenko. His promoter chimed in quickly. “Let me answer the question. I’ve said this before, there is no rush, as you guys see, Lomachenko has to rush, he’s 30 years old, I don’t know how old he is, he has to rush. This kid is still young, theres no rush, we’re going to take our time. But one thing I want to say is, we’re not ducking or dodging any opponent”. Shortly after, Floyd stated that he wasn’t interested in matching Gervonta up with Lomachenko because the Ukrainian fighter didn’t command enough revenue for the fight to be made, and wasn’t a star. Davis had yet to headline a fight in the United States, and meanwhile Lomachenko was fighting regularly on HBO and ESPN main event cards. Shortly after, Davis fought in the Mayweather-McGregor undercard. Despite it being a good platform for Davis — as it turned out the fight itself did 4.4 million pay-per-view buys — he fought a relatively unknown Costa Rican fighter in Francisco Fonseca. Davis wind up missing weight and lost his belt on the scales. He’s now set to return April 21st on Showtime, against Jesus Cuellar, a fighter who hasn’t fought since December of 2016. Cuellar’s last fight was against Abner Mares, which he ended up losing by split decision. Risk vs reward. That’s what Floyd instilled in Gervonta Davis. The notion that Gervonta Davis wasn’t ready for a potential unification fight against Vasyl Lomachenko was a poor excuse. It’s clear that Davis now holds the same ideology that his promoter believes in. Lomachenko ended up calling out Davis on social media, and to that response, Davis replied “you can’t rush greatness, baby”. His promoter’s CEO, Leonard Ellerbe, also played a roll into the idea that Davis doesn’t have to fight Lomachenko . Ellerbe responded to Davis’s tweet by saying “we move to our own music”. Its clear that they wanted no part of Lomachenko. Creating the notion that Davis was in no position to have to face him. Tireless arguments abound that Davis is still young, and needs to develop. But if that was the case, why fight for a title? When it comes to winning a belt, the time of “developing” comes to an end. Floyd could’ve easily pulled Davis out of the Pedraza fight, if they really felt that Davis still needed more seasoning to his game. Once you win a title, you’re good enough to fight for other belts in the division, and fight the best, instead of holding the belt hostage. Davis does only have 19 fights under his belt — which isn’t much for his professional career. However, he does have 221 amateur fights under his belt, which more than gives him enough development to be able to compete with the best in his division. Despite all the talk and excuses, it appears we won’t see that fight take place anyway. Lomachenko will move up in weight for his next fight, and will either face Jorge Linares or Ray Beltran for a lightweight belt. Perhaps in the future, when Lomachenko continues to age, and Davis is ready to move up in weight, they may meet. But until then, when it comes time to talk about Gervonta Davis as possibly one of the best fighters in the world, look back at the time when he wasn’t “ready” for a hard fight against Lomachenko. Vasyl came into the pros with 397 amateur fights. Lomachenko faced Orlando Salido and Gary Russell Jr in his 2nd and 3rd professional fights. He lost by split decision against Salido, but despite suffering his first loss, it appears that Lomachenko learned from his loss and returned even better. So what if Lomachenko would’ve been the considerable favorite against Davis, and so what if Davis would’ve lost? Fighters can learn from losses, and it tends to make them better fighters in the long run. Saving a fighter’s undefeated record is the most overrated thing in boxing, and it doesn’t equate to being the best. Who you face, and when you face them, matters more. In the end, fighters earn more respect in the sport by going out of their way to fighting the best. Money eventually comes a fighter’s way when they’re skilled enough, and have the backing of fans to are willing to watch them in big fights. Davis would’ve gotten more credit for fighting Lomachenko. Instead, he’s viewed as ducking top competition, because his team is more concerned of protecting his undefeated record. Gervonta is a talented fighter, his journey fighting for another title begins this April. If he wants the money, big fights, and recognition, he needs to go out of his way to ask for those fights, and not hide behind his promoter. Lomachenko suffered his first loss as a pro in his second fight. Now, with 11 fights under his belt, his stock is even higher than it was before. Having a loss on your record isn’t the end of the world, and it isn’t a major setback. Perhaps Davis will never be “ready” to face Lomachenko. This article was originally published here at Ringside Box Talk. For more from Mike, follow him here. Canelo vs GGG: A trilogy in the making?